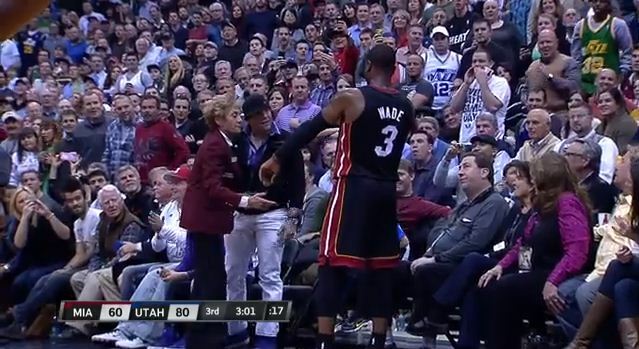 Dwyane Wade will not have his buttons pushed and demonstrated such, Monday, when a Utah Jazz fan was escorted from his floor seats at EnergySolutions Arena by security after too much taunting of the Miami Heat guard. Your expensive purchase of floor seats at an NBA game does not grant you license to antagonize or hassle the player’s on the court. Granted, a little trash talk from fans is expected by a visiting team, but don’t get carried away. This dude got beside himself, and he and his tacky interesting wardrobe were asked to leave the premises. Didn’t you love D Wade’s gesture? Ultimately. the Jazz defeated the Heat 104-97.